Overnight bridge work requiring motorway closures will be carried out at junction 15 of the M1 near Northampton from Monday 23 June to Monday 4 August. Routine inspections have revealed the protective paint system on the beams of the Grange Park Bridge, which forms part of the junction with the M1, A45 and A508, has deteriorated. We therefore need to remove the current system and repaint all the beams. The work will prevent deterioration of the bridge, and reduce the need for more extensive maintenance in the future. 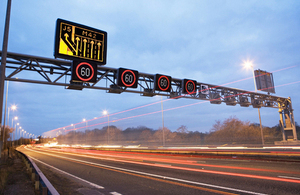 The work requires the overnight closure of the M1 between the exit and entry slip roads at junction 15. Only one carriageway will be closed at a time. Work will start on the northbound carriageway and move to the southbound after approximately three weeks. Traffic will be diverted up and over the junction. Closures take place between 10pm and 5am with 24/7 hard shoulder closures and a 50mph speed limit.